Workman Publishing Company, 9781523504268, 144pp. For every brave soul who wants to just say no—no to meeting the gang for drinks, no to wishing a coworker happy birthday (unless there’s free cake involved), and no to dating of any kind—here comes Blair, the master of living life in sweatpants and talking only to her cat. With her dark but totally honest perspective, Blair will teach you how to become an antisocial hermit, fail at your boring job, sabotage your relationship, and always—always—give yourself permission to choose the couch over the gym. Mo Welch is a stand-up comedian and cartoonist. She appeared on Conan in January of 2018. Her 10-part animated series, Blair, debuted on TBS Digital in January 2018. She starred in Foul Ball on CBS and Hulu's Coming to the Stage, and appears in season two of Amazon's Gortimer Gibbon's Life on Normal Street and season two of Life in Pieces on CBS. She has worked as a writer for Nickelodeon, TBS, and CBS. The Chicago Reader called her "hysterically brilliant," and Splitsider calls her "impossibly cool." Along with her comics, she was featured on Buzzfeed,The A.V. Club, and Serial Optimist and is a regular comics contributor to Hello Giggles and BuzzFeed. She and her Blair comics are on Instagram @momowelch (with more than 65,000 followers) and on Facebook @BlairTBS. How To Die Alone is such a wonderful, relatable book that I would share it with my friends if Blair hadn't convinced me to stop talking to all of them! Do you wish you had more friends and an active, fulfilling social life? 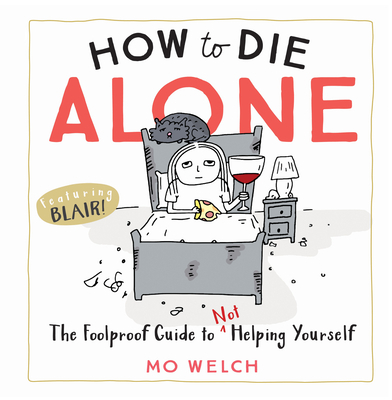 Then read Mo Welch's hilarious How to Die Alone and you'll stop wishing altogether. Buy this book and know peace.